Coral Penelope Lambert, professor of sculpture in Alfred University’s School of Art and Design, has been recognized as one of the top three candidates for the International Sculpture Center’s prestigious Outstanding Educator Award. 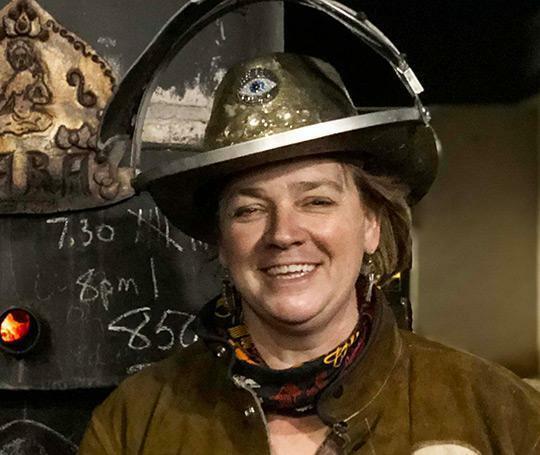 ALFRED, NY – Coral Penelope Lambert, professor of sculpture in Alfred University’s School of Art and Design, has been recognized as one of the top three candidates for the International Sculpture Center’s prestigious Outstanding Educator Award. The International Sculpture Center (ISC) received 64 nominations from 32 institutions worldwide for the 2019 Outstanding Educator Award and Lambert was ultimately named among 20 finalists. Last week, Lambert learned that she was named one of the top three final candidates for the award, which was won by 2016 John Simon Guggenheim Fellow Colleen Sterritt, a Los Angeles-based artist and professor of sculpture at Long Beach City College. Lambert was selected in the top three for having an exemplary career that combines personal studio practice and measurable academic performance. She was evaluated on her 20-plus year career of teaching, creative output, knowledge in the history, theories and innovations that compose the subject of sculpture. As a result of being recognized in the top three candidates Lambert will be rewarded with an individual Professional Level Membership to the International Sculpture Center and her nomination will be reviewed again automatically next year. Lambert has been teaching at the New York State College of Ceramics at Alfred University, School of Art and Design, for 11 years, following a teaching career that began in England in 1993. In addition to serving as professor of sculpture, she is also director of the National Casting Center Foundry at Alfred University.